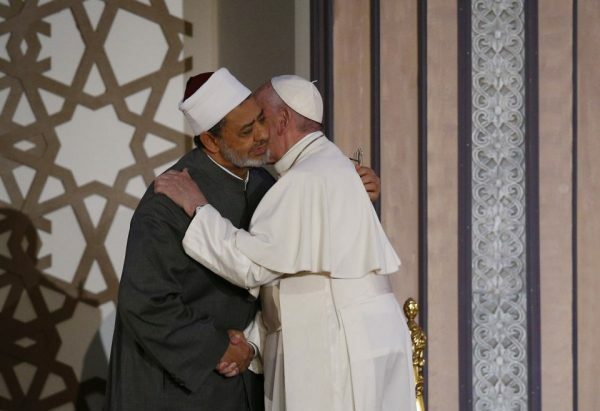 Christians, Muslims and Jews who are sincere about their faith must be committed to protecting the special character of Jerusalem and to praying and working for peace in the Holy Land, Pope Francis wrote in a letter to the grand imam of Egypt’s al-Azhar University. “This is the only aspiration of those who authentically profess themselves to be believers and who never tire of imploring with prayer a future of brotherhood for all,” Francis wrote in the letter to Sheik Ahmad el-Tayeb, the grand imam. El-Tayeb hosted a meeting Jan. 17 with Christian and Muslim clerics and regional political leaders in reaction to U.S. President Donald Trump’s decision in December to recognize Jerusalem as the capital of Israel and to begin preparations to move the U.S. embassy there from Tel Aviv. “In particular, I raise heartfelt prayers that leaders of nations and civil and religious authorities everywhere would work to prevent new spirals of tension and support every effort to make agreement, justice and security prevail for the populations of that blessed land that is so close to my heart,” the pope said in the letter, which was published Jan. 18 by the Vatican. Now the discussions about true believers have started – Who are the true believers? Christians, Muslims and Jews who are sincere about their faith must be committed to be the true believers. History have shown us how Christians and Muslims protected the special character of Jerusalem, all of them are true believers. Praying and working for peace in the ‘Holy Land’ is not enough, there must be a sincere will to do it – So far, I have not seen any sincere will to do it.